When Monmouth Park opens its 69th season Saturday afternoon, there will be a host of changes, both on the racing end and also away from the track. It’s all in an effort to help save one of the East’s most picturesque racetracks in an industry that has certainly seen better times in the Garden State. First, there are the changes on the track. Monmouth Park is offering trainers and owners bonuses for simply entering their horses in non-state bred races. Trainers will receive a $300 bonus for starting a horse in a non-state bred race, while owners will receive $700 for every non-state bred dirt starter and $500 for every open turf horse entry that finishes fifth through last. For those horses running out of the money, that will make a big difference. Over the course of the 2013 meet, the race fields averaged 7.8 horses per race. Kulina predicts that the new bonus system will increase the average fields to almost nine per race. While perennial Monmouth Park favorite jockey “Jersey Joe” Bravo, so known for his endless summers spent at Monmouth, will take his talents to New York this summer, Kulina feels that there are other jockeys who will pique the bettors’ interests. Kulina believes that the weekend racing schedule (Friday, Saturday and Sundays, with the occasional Monday holiday), similar to last year, suits Monmouth Park fine. Kulina is also excited that the William Hill Haskell Invitational, the crown jewel race of the meet July 27, will be televised nationally on NBC. Meanwhile, off the track, Monmouth is seeking to make better use of its large parcel of land. Drazin, for one, is ecstatic about some of the plans in store. Monmouth Park just reached an agreement three weeks ago with AEG Entertainment, the nation’s top event promoter, to build a $10 million amphitheater that will seat 7,500 customers, with a roof covering approximately half of that projected audience. There are also plans to build a boardwalk-style entertainment area, with games of chance and rides, that will be near the general entrance to the park. Drazin said that Monmouth Park has already reached an agreement with Morris Bailey of Resorts International to build a hotel within the grounds of the park, but that is more than likely on the drawing board for the 2016 season. Of course, a lot of the plans are contingent upon the New Jersey state legislature allowing casino-style gaming like slot machines and roulette wheels outside of the current Atlantic City infrastructure. Those plans will also include legalized sports betting, of which Monmouth and partner William Hill hope to be a major part. 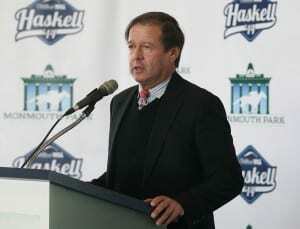 Dennis Drazin,adviser to the New Jersey Thoroughbred Horsemens Association and Darby Development, the operator of Monmouth Park, speaks at the Opening Day Press Conference and Luncheon at Monmouth Park Racetrack in Oceanport, New Jersey on Tuesday May 6, 2014. Photo By Bill Denver/EQUI-PHOTO. If and when the state legislature agrees with Drazin, then, “Monmouth Park will be well positioned, not just this year, but for years to come,” he added. Drazin said that he was comfortable with the leadership of Kulina, who has been involved with Thoroughbred racing at Monmouth Park for the last 42 years. So while Monmouth Park’s leadership remains the same, there are other aspects, both on the track and off, that have changed. The 57-day meet begins Saturday, with post time at 12:50 p.m. every Friday, Saturday and Sunday through the summer. Jim Hague is a long-time sportswriter, whose work has appeared for Associated Press, the Newark Star-Ledger and Morristown Daily Record. 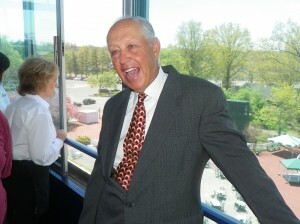 Hague has covered the Belmont Stakes and the Haskell Invitational, among many other events.